This is part 3 of 3 and focuses on the chassis of the BMW F750GS/F850GS. he new offerings from BMW have the motorcycle world abuzz. At Touratech, we can’t wait. We’ve broken down the information provided by BMW Motorrad and done a preview of the F750GS and F850GS. 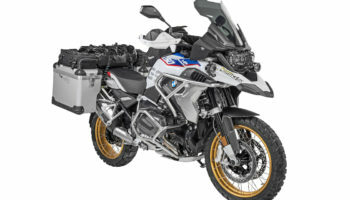 Iain here with Touratech USA, and we’re still breaking down the BMW press release about the new 750GS and F850GS. If you want to learn more about the products we have available for these bikes, check out our website, touratech-usa.com. So now we’re gonna talk about the chassis and the body of this motorcycle. BMW gave us a whole lot of details about the things that they’ve changed on this bike, and I’ve broken it down into the stuff that’s really important. So the biggest change I could see on this new bike is they finally moved the fuel tank. They took it from the back where it was on the F800GS and they moved it back up to the front in a very conventional position. It sounds like it sits above the engine and then comes down below the seat just a little ways. Any of you who’ve ever ridden an F800GS off-road aggressively, you’ll know that the different fuel load really changed the way that the bike handled, and so I think that’s one of the big reasons why they’ve done that. It is important to note that the fuel tank is slightly smaller than it was before, it’s now just four gallons rather than four and a quarter gallons. They say that the motorcycle gets a little bit better fuel mileage, so it’ll be curious to see how it all turns out. But I guess it leaves them a lot of room to make an F850GS Adventure that has a bigger gas tank. The mainframe and sub-frame are both steel, that is the same as it was on the F800GS, but the design of the frame is entirely different now. It looks like the frame takes up a lot less space because they moved the gas tank up front. They say that it’s a little bit stiffer than the old one, we’ll see how that turns out. One thing that they did that is very different is the passenger foot-peg brackets, now bolt on and off of the sub-frame. And again, if you’ve ridden the bike off-road a lot, that’s really important, because as you’re riding off-road and you’re putting your feet on the ground, you can sometimes get your feet caught on the passenger pegs, the same as you get them caught on a center stand fold-down handle. That’s actually another thing, well, we’ll cover center stands later. The seat height, because they moved the gas tank forward, they’ve actually lowered the seat height of the motorcycle 20 millimeters, that’s just a little less than an inch, without changing the amount of ground clearance or the amount of suspension travel that it has. That’s great, a middle-class bike like this should be closer to the ground, be more accessible for more riders, I think. So excellent work there. They have sharpened up the head angle of the motorcycle a couple degrees, and they’ve increased the wheelbase by about, what was it? Slightly longer, a few millimeters. That, I’m curious to see how that’ll play out. My guess is, it’ll handle really similarly to the old one because you make a wheelbase a little bit longer, makes the bike handle a little slower. Make the head angle a little sharper, it makes the bike turn a little quicker. So my guess is those’ll even each other out. Hopefully it’ll have a little bit more stability high-speed on and off the pavement. I think that would be good. Suspension, the travel is about the same as the previous bike. The forks have 204 millimeters of travel, the shock, or excuse me, the rear wheel has 219 millimeters of travel. They have introduced what they call “Travel Dependent Damping” on the rear shock. I don’t know any of the specifics yet, but I’m guessing that’s very similar to the KTM PDS system. Because this is a bike that does not have a linkage on its rear suspension, you need some kind of rising, compression damping rate to help avoid bottoming the bike out hard when you’re riding off-road. That’s something that was lacking on the previous F800GS’s, hopefully they’ve addressed that here on the 850 GS. Dynamic ESA is available for the rear shock, that’s on both the 750GS and the 850 GS. Here at Touratech, we do a lot of our own suspension, and so I actually know what the insides of a lot of these shocks look like, and I’m curious if they still have this, what they’re calling “Travel Dependent Damping System” in the ESA, the Dynamic ESA shock. The way that those adjusters usually work inside a shock absorber take up some of the room that I think they might need for that Travel Dependent Damping. So it’ll be curious to take one apart, see how it works. They are making lowered option bikes just like they did before. So if you’re on the shorter side and that 20 millimeter lower seat still doesn’t get you there, you can get a lowered version, just like you can before, so that’s excellent. A really big change, tubeless wheels on this new bike. So now, you don’t have to worry about carrying spare inner tubes, you’ve got tubeless wheels just like all the other big BMW’s, you can just plug a tire and go. That helps your tires run cooler on pavement, helps them last a little bit longer, and typically makes the tires a little bit stiffer for riding with more weight on the bike, which is great. BMW says that they have taken care to ease the standing position on the motorcycle. So by that, what they mean is, if you’ve ridden off-road on a previous F800GS, you’ll notice that there’s a lot of sharp lines on the motorcycle in the body, primarily at the gas tank at the back, there’s two sharp corners that stop you from moving backward very far, and on the front, those two intake snorkels that come out on the bodywork. Those guys also had sharp edges on them and they blocked your knees from moving forward. From looking at the photos, it looks like they did slim the bike up quite a bit in the middle, and really smoothed out the area where you would be moving while you’re standing. Hopefully, that makes it a lot easier to move around on the motorcycle off-road. From a few of the changes that they’ve made in the chassis here, it sounds like BMW is really trying to make this bike a more comfortable off-road machine, which is excellent. I think that’s the direction that this middle-class is going, and so I’m really curious to ride one and see how it works. They also moved the exhaust, so BMW has a history of making a big deal out of this, which we always chuckle about. But they have realized that having the exhaust on the left hand side of the motorcycle sometimes makes it difficult to push the bike around when you aren’t standing on it because you can burn your pants on the hot exhaust. So they have now moved the exhaust to the right hand side of the motorcycle, like everybody else does, so that it’s not a problem. When they did that, they also moved the chain and sprockets to the left hand side of the motorcycle so now the F850GS is gonna be just like every other chain-drive bike, where the exhaust is on the right hand side, chain’s on the left hand side, just like it should be. All right. Last thing, everybody’s really excited. How much does this bike weight? The DIN weight, which breaks down by saying, “The motorcycle is ready to ride, all its factory equipment, with a 90% full gas tank”, that means three and a half gallons, the F850GS weighs 505 pounds. That’s actually a great number. It’s in the ballpark of where the F800 was before. With the increased suspension technology, the increased electronics, the increased displacement, the increased horsepower, I think that’s gonna be really cool. One thing to be aware of, you can blame Honda for this, all these new middle-weight motorcycles, they don’t come with center stands as standard. So bear in mind that that weight is without the center stand installed. The reason they do that is because the center stand with all its pivots and its springs adds about 10 or 12 pounds to a motorcycle, so everybody’s in this weight battle where they want to be the lightest bike. So now, center stands are optional. So again, 505 pounds with three and a half gallons of gas onboard, if you take the gas out of the tank, that comes out to 483 pounds. Really excited, that’s a great number for a middle-weight bike. We’re really looking forward to it. If you wanna learn more about the bike or the products that we’re making for it, visit our website, touratech-usa.com.